After following John Moy’s blog series on setting up the Netweaver Gateway trial on Amazon EC2, I thought it would be helpful to share how to connect your shiny new gateway trial to the ES Workplace ERP. Since using the ES Workplace systems a couple years ago for a CRM Mobile app, I have always praised the ES team for putting together a great set of resources for encouraging and enabling a service oriented architecture (SOA). The systems (ECC, CRM and PI) are great for doing testing against and developing POC’s or demo apps. In this case we will be using the ERP instance to connect our Gateway system for data consumption. In this example we will be initially connecting our systems together and then going through setting up a very basic example of consuming data from the ES Workplace ERP system via the Netweaver Gateway system sitting in the AWS cloud. Please note that the Prepackaged Netweaver Gateway Trials already have this configured and ready for your username/password. Once you have created your account, I suggest logging in and changing the initial password you received through registration. Its also just a good idea to check you are able to gain access to avoid any issues down the road. Click on ABAP Connections and select the “New” icon. 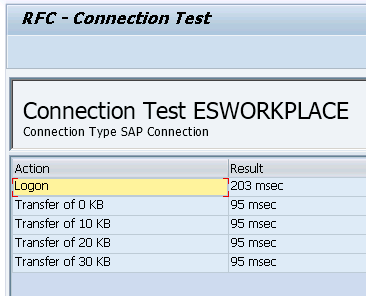 Name your RFC Destination and make sure that Connection Type is configured to be 3 – ABAP Connection. next click the “Logon & Security” Tab and enter your ES Gateway Credentials and save the connection. After saving, select “Manage SAP System Aliases” and enter the details which will create a system alias for the ES Workplace ERP system. Click the connection test button and you should receive a screen looking like this. Once this is done, we are ready to create our webservice. Open up SE80 and create your Gateway Data Model. Be sure to specify your System Alias when creating the Model. Per the documentation, search for a BAPI you would like to use. Because we defined the System Alias in the previous step, the BAPIs being displayed are coming from the target system, in this case the ES Workplace machine. Continue through the process by mapping the query operation.Also be sure to set a primary key by highlighting your unique property and clicking the “Key” button. Once done, click “generate”. Next up we will create a consumption model for our data model. Open up SE80 again and attach the gateway data model to consumption model. Now we should be done, you can open up the browser and point to your URL listed in SE80 under the consumption model to see the definition and available collections. In the event you try to view a collection and receive the error: No System Alias found for Service, open up SPRO and assign a System Alias to the Service. Here you can see where the ESWORKPLACE alias has been defined. If you queries are taking a long time to load or your dataset is large, don’t forget to limit it/add parameters to restrict the returned records. This can be done when defining the data model. If your service will display locally on AWS but not from another machine, check that the AWS Security Rules include the port gateway is running on (in my case 8000). If you try to view the detail of the you will get an error, this is because I did not map the operation of GetDetail or Read – we only did the Query. Follow the guide to easily add this. If you have a elastic IP associated with you EC2 instance you should be able to call the REST service from any machine connected to internet. (You could also use your public DNS name, its just not all the short! ).